Let's be honest finding the right stock photos are a time saver! If you were like me, when I first started, I looked all over the place for stock images that resonated with me! I would be searching online for a good hour finding different stock photos however the one thing that was missing was...consistency! Consistency is what holds your brand together and will stand the test of time! That's why when I really took an interest in creating images not just for me but for others as well that was my main issue I wanted to conquer. That's why with my styled stock library I make sure that the editing on my images are consistant (light, bright, and airy) all the way around in order to give consistency that is worth being proud of! Making a mark online is my main purpose when creating images and graphics for my members. Here are some of the best ways to brand using styled stock images for your own business. You need to look for One Main Stock Photo Site and stick to it! The first thing you need to do is find the perfect styled stock photo site that matches your brand fully! So if your style is more artsy and moody, my site probably wouldn't work for you, however a place like deathtostock.com would be a great alternative! This site is what I used to use when I was first starting out as a blogger! If you are looking for more feminine, bright and airy images that focus on young entreprenurship then my style would totally fit yours! I have images that are for 3 types of women. Women who are just plain feminine and love a good pop of pastels and girly pinks. Women who have a vibrant brand and love a good pop of color! In addition, I cater to women who are on the more classic minimal side that likes bright and airy images that are more neutral in tone! I have tons of images that go out every month that focus on these 3 types of women. Plus I try to make sure that these images can be combined with one another too for a unique style that is one of a kind! Check out these 3 Types of Women in action! Don't see yours? Let me know! Make sure you are choosing images that match your brand! If you are a fitness brand then you need images that match the subject at hand! Check out how I created a 9 grid feed for a fitness blogger by pairing like images together based on my 3 different types of women from above! To create a cohesive brand you need to have your color scheme throughout your branding. So when searching for stock photos make sure you are finding images that go along with your brand's colors! In the library I made sure to have categories focused around different colors. This makes finding images quick and easy! Remember a consistent brand stays true to it's core values, personality, and color scheme! As a consumer it is important to me to see a brand that is true to everything it holds valuable even down to visuals. So when finding stock photos look for images and even graphics that resonate with those 3 key areas. The last thing you want to do is confuse the heck out of your audience by switching things up. I mean think about IHOP changing their name to IHOb...nuff said lol! Your core values: Your core values need to be present in everything that you do. So find images that resonate with those values. For example if you want people to eat healthy having images of healthy smoothies or fruits will make more sense than a pack of cookies! Your personalty: if your brand is professional and serious then so should your images and the way you communicate. The opposite should be for an fun happy brand. Your images and personality should be read across all platforms. Your color scheme: Of course the last part needs to be directed toward your color scheme. A color scheme will make you noticeable. People will be reminded of your work just through the colors you showcase. Colors communicates the vibe you want your audience to feel when they come across your brand. So if you want to communicate a happy go-lucky vibe then your images need to be bright and colorful with quirky props! Constancy will keep a brand thriving for years and years to come! So make sure when you are choosing your photos and/or graphics that they are aligning with your brand. So I may be a little bit bias but if your brand aligns with my stock photos well She Bold Stock Membership will be the perfect solution to finding consistency! With over 1500 images, social media graphics, and templates you are sure to find what you need in all on place! 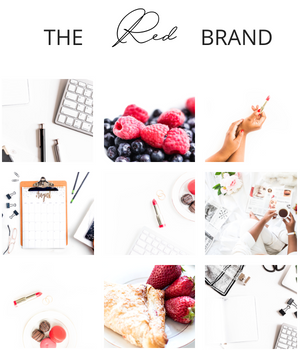 I send out over 75+ images every single month and I'm constantly finding more ways to make branding easier for you. Need Stock Photos, We Got Stock Photos! Grab these 30 free stock photos for your next content creation today!